SQL Anywhere® Does Things The Way They Should Be Done. 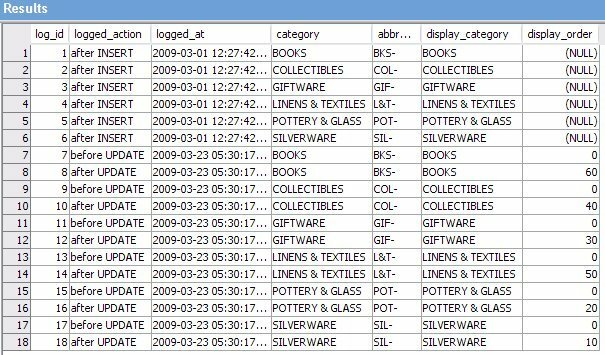 But what if all data changes made to the category table are already being recorded in the logged_category table, as described in Revisited: Triggering an Audit Trail? Old rows in logged_category won't look like the rows in category any more, they will be missing the new column. In keeping with the design of the log tables all constraints are omitted from the logged columns. In this situation that means all existing rows in logged_category will have NULL values in the new display_order column... probably a good choice since that column did not exist when those rows were inserted. SELECT * automatically generates a column name list containing all the columns in the category table. You may have heard people shout "Never Use Select Star!"... that may be good advice when you're coding a SQL query in a language like Java or VB, but it's unnecessarily limiting when you're coding application logic in SQL itself. Danger! The Queries are Stampeding! Which database am I connected to?